A study published earlier this year in the Journal of Chinese Economic and Business Studies, co-authored by Professor Peter Williamson of Cambridge Judge Business School, outlined an alternative benchmark for China’s GDP figures based on 150 large companies listed on major Chinese stock exchanges. An article about the study was posted at that time on the Cambridge Judge website. That index has now been updated for all of 2017 and the first half of 2018. On 21st of February 2018 the Journal of Chinese Economic and Business Studies published the article “An alternative benchmark for the validity of China’s GDP growth statistics”. The data in this research was over the period 2010 to 2016. Now all of the 150 companies included in the China 150-companies Growth Index published their 2017 annual figures and the 2018 First Half results. An update of the Growth Index for the interested parties seems appropriate. The Growth Index is compared with the nominal GDP (not corrected for inflation) to which corporate earnings are more closely tied. These nominal GDP figures are higher than the typical quoted real GDP numbers (which are corrected for inflation and therefore lower). The 2017 figures are now included. After 2 years where the official GDP was higher than the benchmark (2015 & 2016), now in 2017 the China 150-companies Growth Index is higher than the official GDP. High growth firms in 2017 are internet companies like JD.com, Alibaba and Tencent. Also fast growers are the home appliances companies (part of the consumer goods sector) Midea, Haier & Gree and the metal & mining companies like Yancoal, Hesteel and Baowu Steel Group, partly due to the around 30% higher coal prices in 2017. One interpretation of the higher volatility of the Growth Index between the years is that the statistical methodologies used by National Bureau of Statistics of China result in a degree of smoothing between years (and quarters). The cumulative total variance over the 14 quarterly periods is 3.6% for the whole period or a relative small 0.25% per quarter. 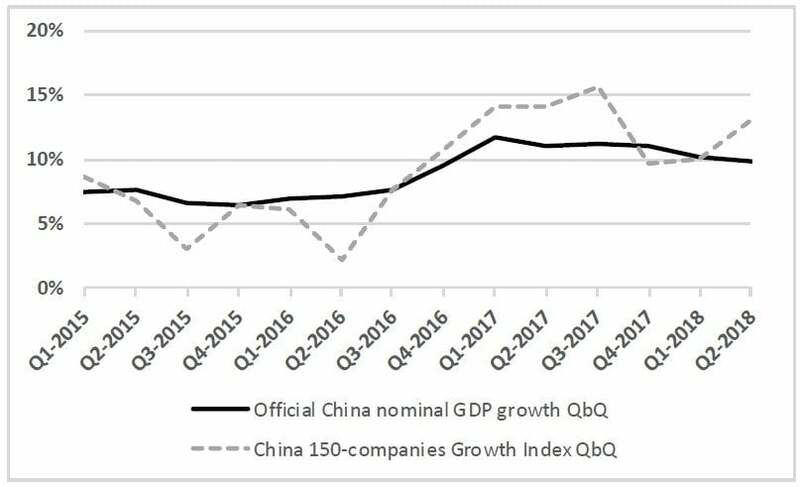 The China 150-companies Growth Index is more volatile, supporting the idea that the statistical methodologies used in China result in a degree of smoothing between quarters (and years) in the official GDP numbers as reported by the National Bureau of Statistics (NBS) of China. The study’s new "China-150 Growth Index" closely tracks the official GDP figures over the medium term (the 2010-2017 study period) as is clearly visible in the graph. The Compound Annual Growth Rate (CAGR) as measured by the China-150 Growth Index is quite close with the official nominal GDP figures in the period from 2011 to 2017: for China 150-companies Growth Index the CAGR-growth is 10.6% per annum and for the official GDP figures it is 10.4% per annum. It seems that the official Chinese GDP growth is much more reliable than expected. Normally this is no real news. However, a significant of commentators have questioned its validity. Some examples are: “The truth behind China’s manipulated economic numbers” (Khan 2016), “Why people don’t trust China’s Official Statistics” (Koty 2016) and ”Whether to believe China’s GDP figures” (The Economist, 2015). 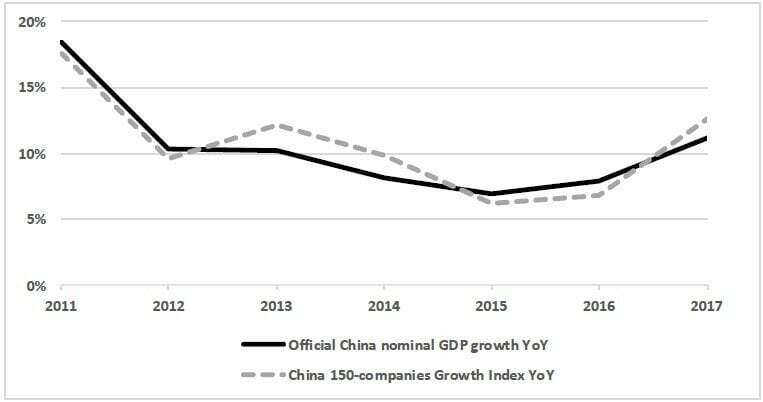 The China 150-companies Growth Index indicates that growth in Chinese GDP has been more volatile between years than reported in the official figures. The Quarterly Growth Index of the 150 largest companies is even more volatile than the official Quarterly GDP growth figures. One interpretation is that the statistical methodologies used in China result in a degree of smoothing between quarters and years in the reported GDP numbers.